AUSTIN, TX (August 17, 2017): Catalyst, an Austin-based agency specializing in creative marketing for student and multifamily housing, has been awarded a contract with STL CityWide to oversee marketing for Tribeca, its newest 160-unit, multifamily property at 5510 Pershing Avenue in St. Louis, MO. 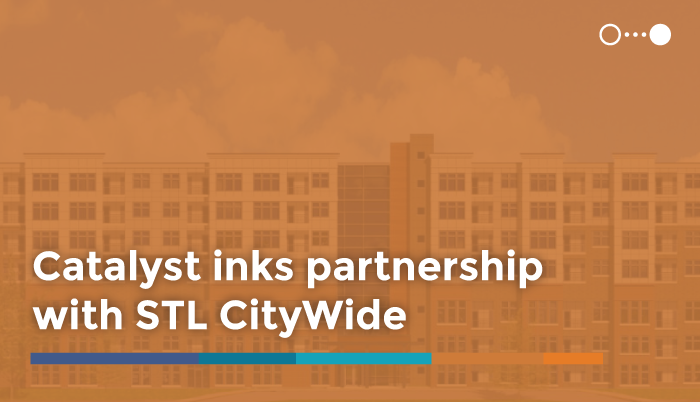 As part of its mission to provide great living options in urban environments, STL CityWide will launch the property in the spring of 2018. With the look and feel of a boutique hotel, the property will boast a courtyard, pool, state-of-the-art fitness center, self service drinks, and concierge service. Featuring smart technology throughout the development, the building will consist of 24 efficiency, 111 one-bedroom, 23 two-bedroom, and 2 three-bedroom units rising to seven floors. Catalyst will create a logo and custom website for the new property – and also manage Search Engine Optimization (SEO), lead generation campaigns, 3D floor plans, marketing collateral, and a 3D fly through video with Virtual Reality capability.